Long before the Stranger ever entered the lands of Sosaria there was a young wizard named Mondain. As Mondain grew in age and knowledge, so grew his thirst for power. Eventually he learned of the Gem of Immortality and, after considerable effort, secured the Gem to use in a ritual that would give him ultimate power. During the ceremony that bound the Gem to Mondains spirit, the Gem itself captured an image of the spirit of the entire land. All of Sosaria was caught in this snapshot, save the wielder of the Gem -- Mondain himself. Once imbued with the power of immortality, the Gem provided Mondain the means to rule the world-- until the Stranger arrived to destroy the very source of Mondains power, that is. Mondains power was gone, and with it the sorcerer himself was destroyed. But as the essence of immortality was loosed upon the land, the very multiverse began to unravel.Aware of the devastation caused by the destruction of the Gem,the Time Lord grabbed a hold of the fabric of time and space and re-wove the fibers of Sosaria, later to be called Britannia. Concerned by the results of the natural course of events, whereby one mans quest for ultimate power nearly annihilated a world, the Time Lord set into motion a plan to ensure that the land would come under the rule of the right. 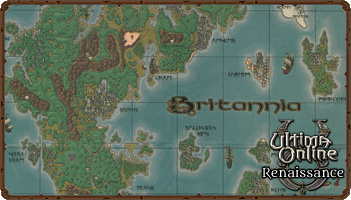 Behind the scenes, he reconstructed the world and maneuvered happenstance to permit the reign of Lord British, the virtues, and the Avatar.Thus the continuance of the Ultima series. But when the Gem was shattered, thousands of splintered fragments scattered across the multiverse.Within the facets of each fragment lay the very image of Sosaria as it had been captured during Mondains ritual. Each of these in turn became parallel instances of The World, each replete with their own version of Sosarian culture, kingdoms, and histories. However, unlike the original Sosaria -- which saw such events as the corruption of Mondain,the rise of Lord British,the quest of the Avatar,and the appearance of the Fellowship, all seeded by the efforts of the Time Lord -- these Sosarias have been left to their own devices, where the rise and fall of power is often a daily occurrence. It is on one of these Worlds that the adventurers of Ultima On-line will come to make their fortunes and reputations.